Deepika Padukone's character Padmavati from Sanjay Leela Bhansali's upcoming film has a look that is nothing less than ethereal and royal, and this regality is shared by Shahid Kapoor's character Maharawal Ratan Singh, who is her husband. Kapoor recently released his look in the film; he sports long hair, traditional Rajput clothes and accessories, and a sombre expression. The look in his eyes is one of vigilance, and you can tell that his character has seen many wars as is evident from the scar on his cheek and the bloodied marks on his clothes. Padukone's look is characterised by an expression of reverence and the unmissable red outfit and gold jewelry. Her character commands respect, while his commands awe. This film is slated to release on 1 December. Padmavati has been at the center of controversy over its content for almost a year. 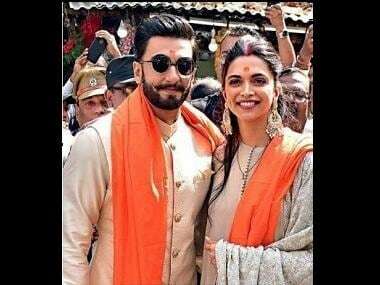 On 24 September, Shri Rajput Karni Sena, an organisation of the Rajput community, burnt posters of Sanjay Leela Bhansali's much-awaited film. A group of protesters gathered in front of Rajmandir Cinema Hall and shouted slogans against the filmmaker and his project. In January, activists of the Shree Rajput Karni Sena had protested, manhandled and misbehaved with the crew of Bhansali's Padmavati claiming that he was distorting historical facts in the movie. They had also damaged some cameras and other equipments. Bhansali had to stop shooting. In March, some miscreants broke the mirrors in Padmini Mahal (palace) in Chittorgarh Fort where Ala-ud-din Khilji is believed to have seen Rani Padmavati or Padmini. In the same month, the film's sets in Kolhapur were set ablaze by unidentified men.